HomeLesson Plans & ActivitiesRole PlaysO Romeo, Romeo, wherefore art thou Romeo? English learners need to use their English in productive settings to improve their communicative skills. One of the most fun ways to do this is by working on collaborative projects and role-plays. This lesson plan focuses on helping students write a short script (lines for the Balcony scene), practise the dialogue and perform for fellow students. Step 1. Pre-writing discussion. 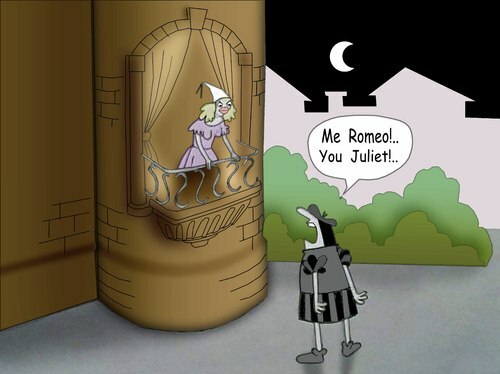 Show a funny summary of Shakespeare’s Romeo and Juliet. Ask your students how Romeo and Juliet’s love story could develop in modern times. Step 2. Explain the project to the class – students should create the lines for the infamous balcony scene themselves. Stress the idea that the conditions are modern and students may choose to change how the plot develops. Step 3. Split students into groups of 3. In each group students should write the dialogue between Juliet and Romeo in a modern setting. Step 4. After the groups finish up writing a dialogue, ask students to assign the roles of Romeo, Juliet and Shakespeare (the playwright). Then, ask students to pass their dialogues to other groups, while the playwrights should join those groups who have their dialogues. Step 5. Rehearsal time. Ask students to practise their script in the group until they feel comfortable with their lines. The playwrights should act as directors of the play. Step 6. Get up and perform!